It’s up! 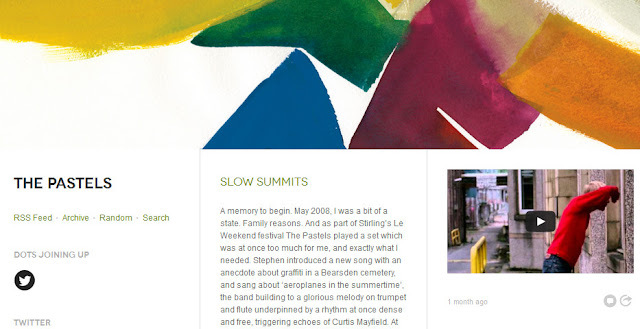 I was wondering when and where that would happen, but the press release I wrote for the wondrous new Pastels album Slow Summits (out in May) is now online on a brand new Pastels website, here. Huge thanks to Stephen and Katrina for asking me to do it. Part Two will feature some of the things which got discarded along the way. First off, this book has a great feel. I was talking a while ago about how what the internet really lacks is any kind of friction, and although I must admit I did buy this book on the internet (it was so easy), the moment your hand hits the cover it is slowed down by its texture, which is more like velvet than your average paperback. You just have to pause to paw it. Its diminutive dimensions (107mm x 174mm x 12mm) are a good fit for my left, book-holding hand (98mm x 200mm x 30mm) and it recalls, in form and function, a 2002 reprint I have of Jimmy Cauty and Bill Drummond’s The Manual [How to Have a Number One the Easy Way], which is only 147mm tall, but otherwise much the same. It features much better proof-reading than some of Bill’s books, some cute hand drawn illustrations, and what is possibly the best author photograph of all time. It’s very well written, too, as you’d expect from such a witty songwriter, and yet... This is a ridiculous accusation, really, but it feels — once you’re off the texture and into the text — a little too scattershot. Its polemical thrusts are isolated (mainly accusing the US gov’t of fascism), and there is the problem that, since The Manual came out at the height of the music industry’s monetary success, there has been such a change in the ‘greatest thing in the world to be’ that — well, a pop star certainly isn’t it, anymore, let alone a member of a rock ’n’ roll group. In 1988, it was obvious why a manual explaining how to have a number one single was a good idea; in 2013, though, why would anyone who doesn’t already know all about groups want to find out how to make one? Now that’s a theory. Ominous not only in its biblical intonation, but in its suggestion that now, through and beyond industrialisation, we have reached a stage where we can replicate anything. And if nothing can die, nothing can ever be perfect again.